SUBSCRIBE NOW AND SAVE 82%! 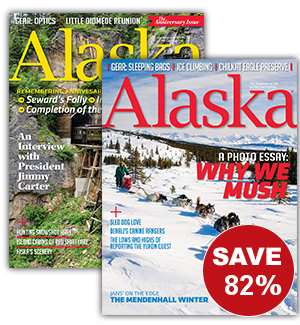 Get a subscription to Alaska Magazine your way! Since 1935 Alaska magazine has been exciting Alaskans—and Alaska lovers— with tales of the Last Frontier. Subscribe now and your subscription will include spectacular full color photography, award winning articles and content about the most exciting state in the union — plus expert advice on hunting, fishing, adventure travel and so much more!